Despite its humble existence, the simple sandwich is a staple of the North American diet. Look at it. It's portable, can be eaten without utensils and is generally inexpensive. Like the modest burger, the sandwich has gone upscale. No, it's not a new revelation or concept really. 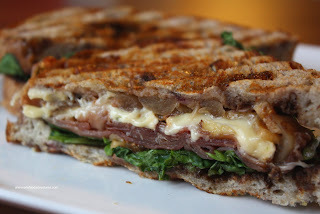 There have been gourmet sandwiches for quite some time. Gone is the bologna on white bread. Enter now artisan sandwiches with high-end ingredients that require deciphering via a culinary encyclopedia. Considering that sandwiches from Subway and Quizno's can set you back a pretty penny, it is not a stretch to pay a bit more for quality. My personal favourite in town is the Pear, Proscuitto and Brie at Finch's. The Porchetta at Meat & Bread comes in at a close second. 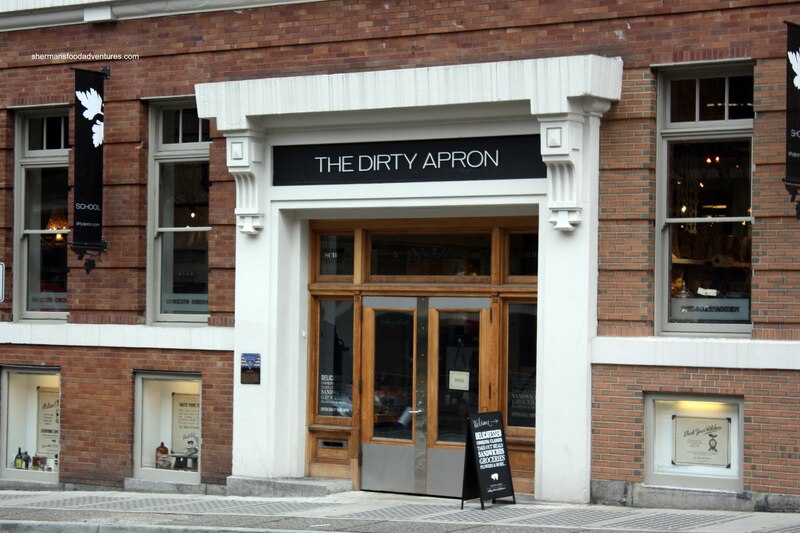 Entering the gourmet sandwich ring comes The Dirty Apron Delicatessen. Yup, it's the same Dirty Apron which runs cooking classes. I wasn't really intending on trying it out today; rather, I was on the mission to find some sausages. Wait, let me rephrase that... I was looking for some hot Serious Sausage on a street corner. Er... Okay, I'll stop now. 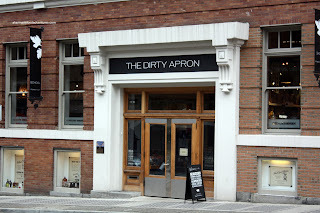 I ended up bypassing the sausages and went down the block to The Dirty Apron. I ended up picking up 3 sandwiches to go. The first and probably the best was the Grilled Proscuitto with figs, watercrest, cambozola and balsamic onions. I thought the combination of the ingredients covered the spectrum of flavours from the saltiness of the proscuitto to the bitterness of the watercrest. However, Viv thought there was too much going on. Difference of opinion I suppose. We can't let a sandwich come between us can we? Of course I had to get their popular BBQ Pulled Pork Baguette. You see, it does its very best to emulate a Vietnamese Banh Mi, albeit at more than double the cost. 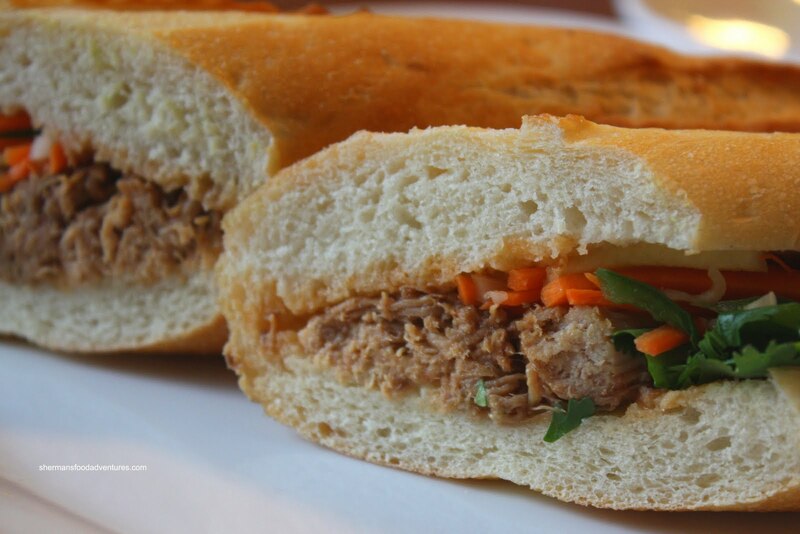 It is a combination of pickled carrots & daikon, cilantro, jalapeno and mayo with Asian-spiced pulled pork. 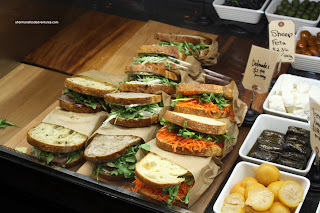 Without thinking about a Banh Mi, the sandwich itself was good. 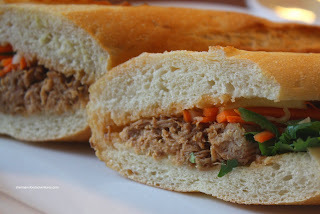 Of course the flavours work since it is essentially a take on a Vietnamese sub. Taken for what it is, I liked it. Thinking about spending 1/2 the price on a grilled pork Banh Mi made me think twice. Our last sandwich was the Crab & Shrimp Baguette with Aji vinaigrette, avocado, peppade w and pea shoots. Predictably mild tasting, I did get the natural sweetness from the shrimp and saltiness of the crab. The peppadew added some sweetness with a touch of spice and the pea shoots offered up some fresh greens. However, I personally would've liked impact, possibly more peppadew. On average, the sandwiches are roughly $8.00 each at The Dirty Apron. Certainly not inexpensive while not exactly breaking the bank either. 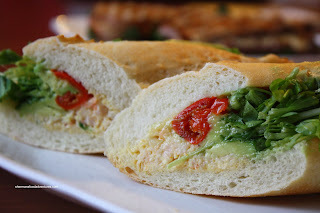 Consider a "seafood" sub at Subway costs just as much for imitation crab (albeit bigger). We thought the sandwiches were made with high quality ingredients and with care. It definitely warrants another visit to try some of the other offerings. Actually, the baguettes are made fresh, the only sandwiches "premade" are the grilled ones. I don't mind that since they are grilled and not served cold. Do you know what I mean? If they were premade and served just like that... yuck. Besides, they have really high turnover, my Proscuitto was freshly made, I had to wait 5+ minutes for it. The size of the baguette would be somewhat bigger than a Banh Mi (longer, but narrower). The grilled sandwiches are quite large actually. Lots of filling. Seems you've been on a bit of a sandwich spree. My newest discovery is Cafe Meme on Hastings in Burnaby. It's simple ingredients done right and their onion soup is outstanding, I like quality, but not high prices. Chez Meme? LOL. It's so close for me but I have yet to try it. Funny how that happens!